On iPhone 4s or later, you can dictate instead of typing. Make sure Siri is turned on (in Settings > General > Siri) and iPhone is connected to the Internet. Note: Cellular data charges may apply. See Cellular settings. Dictate text. Tap in the onscreen keyboard, then speak. Tap Done when you finish. Add text. Tap again and continuing dictating. To insert text, tap to place the insertion point first. 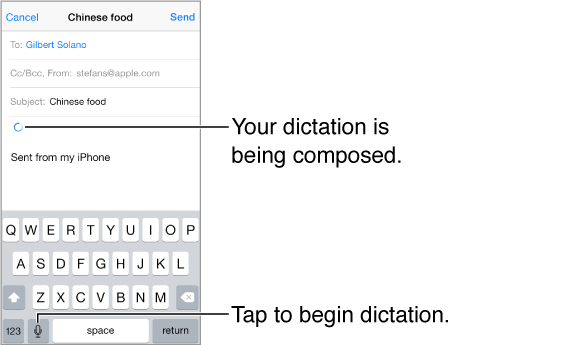 You can also replace selected text by dictating. You can also start dictation by bringing iPhone to your ear, then moving iPhone back down in front of you when you’re done. To turn on this feature, go to Settings > General > Siri.